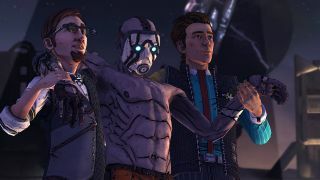 Telltale Games has released a trailer for Atlas Mugged, the second episode in the Tales From the Borderlands adventure series that's expected to come out next week. Things seem to be getting worse for lead characters Rhys and Fiona in part two of Tales From the Borderlands. While they try to figure out what the Atlas Corporation was doing prior to Hyperion's takeover of Pandora—a quest crowded by Vault Hunters, Bounty Hunters, Vasquez, and worse—Rhys finds himself coming face-to-face with visions of Handsome Jack, who's supposed to be dead. That's a little strange, isn't it? It's worth noting that the launch date isn't carved in stone as of yet. Telltale said in the announcement that Atlas Mugged is "expected to be available," as opposed to "will be available," the week of March 17. It'll likely happen on time—it's getting awfully close to the wire for a delay—but until it's nailed down, anything is possible.